Arms is the first Nintendo game with new IP for the Nintendo Switch console and it’s going to release soon. So far we’ve had sequels, or ports of existing games such as The Legend of Zelda: Breath of the Wild and Mario Kart 8 Deluxe being released, or small indie titles. New IP is always exciting because it gives game developers a clean slate, and allows room for fresh ideas that may not be possible with established games. That’s what Arms sets out to do. It’s a fighting game for the Nintendo Switch. It’s called Arms because the characters have spring-like arms that zoom towards rivals to land punches. Unlike traditional fighting games, there isn’t going to be much kicking involved in this one. Here’s everything you need to know about this upcoming Nintendo game. Arms is scheduled to release on June 16 and will be priced at $60 (roughly Rs. 3,900) on the Nintendo eShop. You can buy physical copies too, but those won’t be easily available if you don’t live in countries where Nintendo has an official presence. Buying digital may be your best option if you’re in India. Nintendo’s launch trailer and all promotional materials have shown how Arms makes use of motion controls on the Joy-Con controller, but you don’t actually need the Joy-Cons to play this game. The Nintendo Pro Controller will work just as well, as mentioned here. Fighting games can get boring if there aren’t enough variations to experiment with. Arms for Nintendo Switch lets you choose from 10 different characters and each character has three different types of arms to choose from. Each of these arms have different attributes such as fire, electric, wind, ice, stun, explosion, and blind. These attributes decide how your special moves will turn out. You can equip a fire arm on the left and an electric arm on the right to deal two different types of damage. Each arm you choose has a different weight class. Choose light arms and you’ll be able to land more hits, whereas the heavy arms are slower but a lot more powerful. Finding the right balance between speed and power will dictate how your fights pan out. 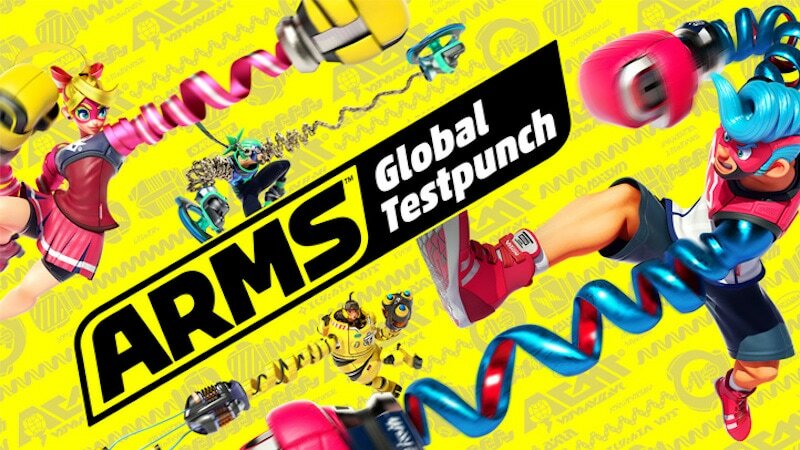 If you want to experience the game before its launch, you can do so by joining the Arms Global Testpunch. It’s going to be held from May 26 to 28 and June 2 to 4. May 26 and June 2 are for North America only. The full list of Testpunch times is available here. Arms demo is a 1.4GB download and you can get it via the Nintendo eShop. Arms has a lot of different game modes to keep you occupied. The basic Fight mode lets you fight against one player, with bombs or healing items dropping on the arena. Then there are 2-on-2 team fights where two fighters are bound by a string. Your attacks can damage your ally, so you need to coordinate well here. If fighting isn’t what you really want to do, then there are modes such as V-Ball (where you play volleyball with an explosive ball), Hoops (try dunking your opponents into a basketball hoop), and Skill Shot (wreck as many targets as possible). There’s also a 1-on-100 mode where 100 enemies attack you. Arms for Nintendo Switch lets you earn in-game prize money as you play various modes of the game. You can use this currency to buy new arms through a lottery system, so you don’t know in advance what you’re getting for your money. But even if you don’t get a new type of arm, the duplicate arm you get will be stronger than the original. This way, there’s some incentive to keep playing the game. Arms has a few battle modes for skilled players. The first is Grand Prix, where you can try to win 10 matches in a row to become the crowd champion. Then there’s a Party Match where you can have two players per Nintendo Switch joining online battles. There’s also a Ranked Match where your rank keeps rising or falling depending on whether you win or lose fights. 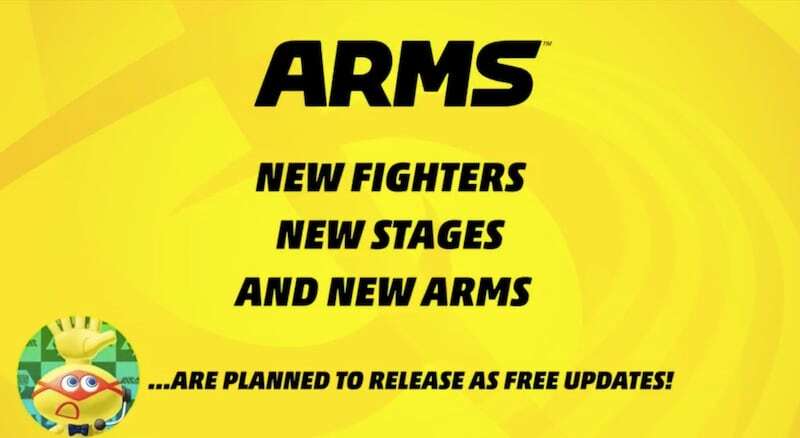 Arms will offer free updates with new fighters, stages and new arms, according to the Nintendo Direct video. Yes, you don’t have to pay extra for “DLC characters” or “premium skins” or “2017 character pack”. It may come as a big surprise to fans of fighting games, but not all games try to make you pay extra for things you should be getting with the game. If there’s anything else you want to know about Arms for Nintendo Switch, let us know via the comments. Stay tuned for more coverage on the game before and after its release.